Modern homeowners demand designs that are at once functional and beautiful, trendy and timeless. 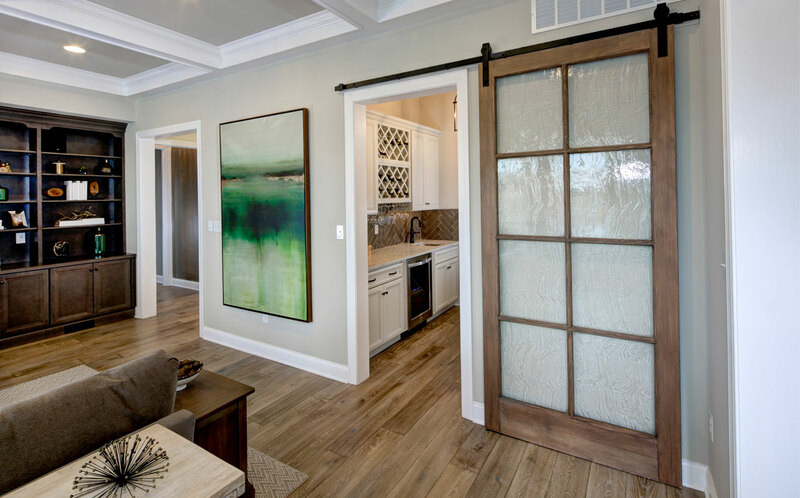 The design team at Montchanin Builders masterfully blends these high-demand elements into our floor plans to create thoughtfully designed homes. One stunning example is our Salisbury floor plan, which is now available in The Town of Whitehall and proudly boasts a butler’s pantry. Prospective homebuyers are undoubtedly familiar with the much-coveted walk-in kitchen pantry. During an era in which storage space is more valued than ever, the walk-in pantry is a veritable wealth of shelves and bins. The butler’s pantry is not the same as a walk-in pantry, which is why the Salisbury floor plan includes both luxury features. In times past, the butler’s pantry was typically a smallish, narrow staging area through which one would walk from the kitchen to the formal dining room. Here, butlers and other servants would arrange menu selections and dining essentials before bringing them out to the dining room. Butler’s pantries usually feature plenty of counter space on which to arrange needed items, along with some storage areas for china and table linens. Sometimes, they would also feature a sink. In the Salisbury floor plan, homebuyers can choose to include the optional sink. Demand for butler’s pantries is on the rise, thanks to the reimagining of this space. Firstly, a butler’s pantry greatly enhances the visual appeal and unique character of a home. It is an elegant space that brings to mind Old World splendor and grace. Second, butler’s pantries in today’s homes are far more versatile than they once were. It’s an ideal location for a wet bar. Use it as a buffet space for less formal dinner parties. Some homeowners opt for small butler’s pantries simply to confine pet feeding activities and pet food storage spaces to an area away from the main kitchen. And in a home with multiple kids, a butler’s pantry is a convenient space for the kids to get their afterschool snacks without creating a big mess in the main kitchen. Regardless of how you choose to use your butler’s pantry, there is no doubt that it will improve the function of your home and the organization of your kitchen. Your home is your sanctuary. 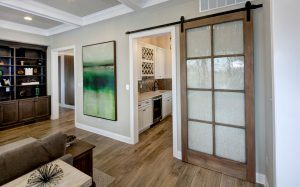 Here at Montchanin Builders of Delaware, we are devoted to ensuring every homeowner’s complete satisfaction with our floor plans and our masterfully designed, walkable communities. We’re confident you’ll be pleased with the Salisbury design and our other floor plans, but you can also request custom features. 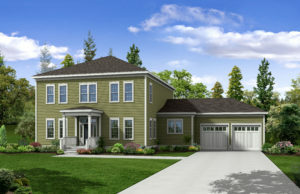 The Salisbury floor plan allows custom add-ons like the finished basement with an optional bar or in-law suite. Or, add an optional wraparound porch to increase your outdoor living space. Call the Montchanin Builders design team today and let us know what you need for your home in The Town of Whitehall. Montchanin Builders also has new homes available at master planned communities in Delaware. Montchanin Builders is pleased to announce the release of our latest floorplan for The Town of Whitehall. The Salisbury Model continues in our tradition of allowing for a high degree of customization in accordance with the homeowner’s unique design, finish, and trimming preferences. This two-story family home with an attached garage has been designed with flex space to accommodate all lifestyles. After stepping up onto the optional front covered porch, family members enter the spacious foyer. From there, they may enter the flex room, powder room, or continue on to the great room with its built-in shelving units. This space embodies all the best of open concept living, with an easy flow into the kitchen and attached breakfast room. Gourmet chefs will love the spacious kitchen island and the walk-in pantry, which is accessible just off the kitchen next to the laundry room. The first-floor master bedroom is an oasis of style and comfort. It features a spacious walk-in closet and beautifully designed master bathroom with his and her sinks, shower, and soak tub. Upstairs, the kids can enjoy the rec room before retiring to their three bedrooms, which feature easy access to the two full bathrooms. The standard features included with The Salisbury Model are likely to please even the most selective of home buyers. The kitchen features 42” maple wall cabinets in your choice of stain, granite countertops, a 4” granite backsplash, and stainless steel sink. If the standard options included with The Salisbury Floorplan aren’t enticing enough for you, consider customizing your new home to your exact specifications. On the first floor, turn the flex room into an additional bedroom for your in-laws and add a fireplace and a private deck to the master bedroom. Improve the convenience of your second floor by adding a washer and dryer to the hall – preventing those trips up and down the stairs with a heavy basket of laundry. Other optional features include a finished basement with a bedroom, rec room, work shop, and full bath or powder room. Upgrade your kitchen appliances, add a tankless water heater to accommodate the demands of your family, and upgrade the kitchen and bathroom cabinets. You could even personalize your home wiring package with optional smart home wiring, recessed lighting, and pre-wiring for your sound system. Improve your outdoor living experience with patios, composite decks, wood-burning fireplaces, or masonry fireplaces. Montchanin Builders has set the standard for new homes in the Wilmington, Delaware area. Our masterfully designed neighborhoods are minutes away from major amenities, yet embody a close-knit spirit of true community. When you move to the Town of Whitehall, you’ll enjoy all that a walkable community has to offer – including parks, nature trails, coffee shops, a family doctor, and an award-winning school district – just to name a few. To inquire about the Town of Whitehall, Darley Green, Shipley Road, or The Cedars, call Montchanin Builders at 302.472.7212.